Mud flaps are rubber mats which are fixed directly behind the wheels of cars, trucks and other vehicles. 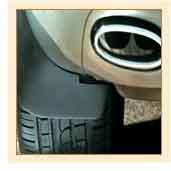 Also known as mud guards or splash guards, mud flaps are a great and a useful feature to have on your pickup truck, SUV, and even your car or your scooter. They are not only the standard accessories for passenger vehicles, but also for all commercial trucks. They are used as safety features on the road. Heavy-duty mud flaps are made from durable polymer materials. The installation not very difficult, but it can at times be very messy and awkward. There is the need for few bolts or screws to hold the mud flap's top to the frame and the bottom edge remains unattached. It is natural that in a rainy weather or on a bad road, car and truck tires are partially submerged as a result of which mud and debris are stuck towards the back of the vehicle by centrifugal force. The main function of mud flaps is to protect your car from mud and other debris flung out by tires. Any kind of road debris, mud, snow, slush contained within your vehicle's wheel is safely shielded by mud flaps from entering your car. And the more debris you keep off your car's finish, the less chance you have of facing the paint damage and rust problems that mud flaps can prevent. Mud flaps also deflect loose gravel and excessive rainwater. Mud flaps help to keep the undercarriage of the vehicle clean. This is possible by rerouting sprays of muddy water by the flaps while the vehicle is in motion. Trucks hauling loose materials like gravel should always take preventions against accidents caused by flying debris. That is why in some areas, the use of mud flaps on commercial vehicles has even become mandatory. There are various small objects on the highway which can be kicked up by the tires while moving, but mud flaps prevent further damage. It is also observed in many vehicles a distinctive pattern of splattered mud behind each wheel well when mud flaps are not used. Small nicks and scratches caused by flying debris can be easily prevented with the use of mud flaps.